It’s shocking to me that more people don’t know about Vietnam. To this day, I hear that people are scared to go there based on the Vietnam War from 40-50 years ago. Popular culture and movies haven’t done much to endear Vietnam to the hearts of Americans but I am here to tell you it’s well worth a visit and will be a destination you won’t soon forget! First, Vietnam is a stunningly beautiful and fascinating country with significant coastline, beaches and two of the cooler cities in Asia. From Hanoi in the north to Ho Chi Minh City, formerly and still often referred to as Saigon, in the south-Vietnam has their bases covered. Filling in the middle of the long, skinny country is an abundance of fun destinations including Nha Trang and Da Nang. However, perhaps the most scenic and certainly a must-see in Vietnam is Ha Long Bay. This is located a few hours from Hanoi and is one of the jewels of Southeast Asia and is possibly the most photogenic place in the region, with apologies to Angkor Wat in Cambodia! In Ha Long Bay, you can sail out on a junk boat and float along the rock islands, snorkel and kayak around or just sit back and enjoy the stunning scenery. Ha Long Bay will not disappoint and if you’re fortunate to spend a night, the night views are even more spectacular with all the junk boats in the water. Whether you’re back in Hanoi or Saigon, you will notice a few things about Vietnamese cities. First and foremost, you cannot miss the abundance of motorbikes! You will literally have to fend for your life crossing the streets! It’s pretty insane but also very cool to experience. I exaggerate of course, but make no mistake - the motorbikes run the roads in Vietnam and they are extremely aggressive. Second, the food is unbelievable! From soup on the street to Vietnamese classics, the cities of Vietnam have some of the best food in Southeast Asia. Come hungry and leave full and don’t plan ahead too much as the best food is sold on the streets! Finally, Vietnam is one of the last cheap destinations left in the world. You can still get by on a few bucks a day. Of course they have things for all budgets but it’s nice to know that you can eat, sleep and play for a negligible amount of money if you want to! Vietnam is a bargain and bargain you will! One other thing about Vietnam that you will have to get used to really quick is bargaining. Everything is negotiable and the price is never really the price. You will need to be a seasoned negotiator or learn quickly as most vendors will not take no for an answer. You may even run into really smart kids on the streets selling everything from books to clothes and procuring money from you for things you never knew you needed! It’s all part of the fun and excitement of Vietnam! 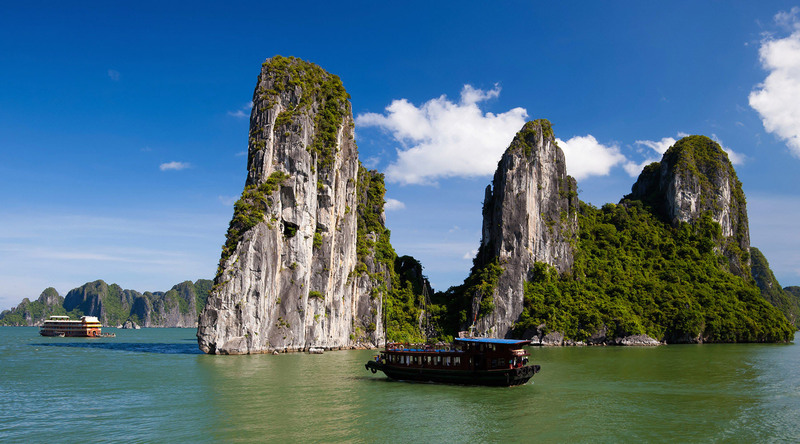 A 15 Night voyage in January 2015, which includes overnight stays in Ha Long Bay, Da Nang and Ho Chi Minh City. The 14 Night Discovering Thailand & Vietnam voyage in November 2015. A 10 Night voyage in December 2015, with three overnight stays in Vietnam.